A Lower triangle Matrix is a square matrix where elements above the main diagonal are zeros. 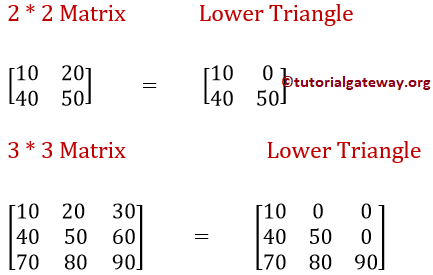 In this article, we will show you, How to write a C Program to find Lower Triangle Matrix with example. 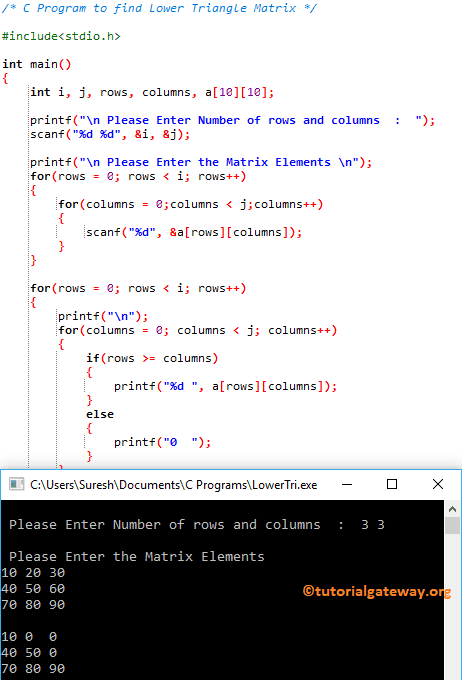 This program allows the user to enter the number of rows and columns of a Matrix. Next, we are going to find the Lower triangle of this matrix using For Loop. In this Program, We declared single Two dimensional arrays Multiplication of size of 10 * 10.
scanf statement inside the for loop will store the user entered values in every individual array element such as a, a, ….. The condition (0 < 2) is True. The condition (columns < 2) is True. The condition (columns < 2) is False. So it will exit from the loop. Next, rows value will be incremented to 1. Next, rows value will be incremented to 1. After the increment the condition inside the first for loop (rows < 2) will fail. So it will exit from the loop.